Sarah Jessica Parker attended The New School University Center Grand Opening held at The New School University Center on Wednesday (January 23) in New York City. The actress wore a ladylike Tracy Reese brocade fit-and-flare frock with a scoop neckline, full skirt and 3/4 length sleeves. This may have been considered somewhat meh, until you look down. Polka-dot tights and a pair of Manolo Blahnik boots featuring a bedazzled trim really enliven this look. At times SJP’s styling can be a bit too much and overwhelm the look, but that is not the case for me on this occasion. 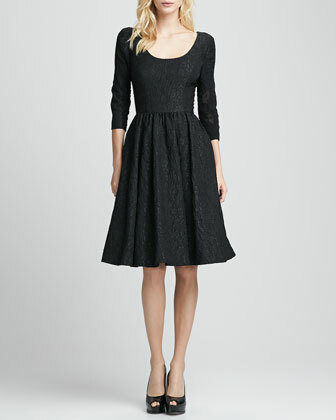 You can buy SJP’s Tracy Reese 3/4-Sleeve Brocade Party Dress from Neiman Marcus.